As technology rapidly nudges the entire service industry towards an experience-oriented world, restaurants have raised their game and how! Restaurants have always been a source of memories for the customers, where they come and feel all their senses come to life. There are entire social media trends and hashtags built on eating experiences. It has become a culture, one that will stick to the millennials. There are no second chances today as customers shed their preferences as per their convenience. One error and they move on to the many takers available in the marketplace. It can be safely said that the need for a simple and memorable experience of eating out is actually leading to a complex technology driving that experience. Ironic. One needs to put in lot of efforts, so that it looks effort-less. Restaurants are opening and shutting down in hundreds because the sustenance strategies are not well thought of. Also, because they are missing that one key ingredient in their business dishes, i.e. the right technology to back them up. To float with these waves of change and to stay breast with the consumer expectations, POS has proven to be the one immutable strength for the restaurant owners. POS or the Restaurant management software is the technology that runs the show at your favourite diner. So, what does it do? Ordering Made Easy– Recording orders, live and especially online is the most important job. We have come a long way from the ancient Kitchen Order Ticket to the current online interfaces. POS systems today, do this with utmost ease and with the most communicative and best-looking UIs thereby increasing kitchen efficiencies by shortening order to delivery time. Manage Inventory– This is an extremely crucial element, because you can’t afford to run out of ingredients for a dish on your menu. Tracks the depleting inventory, alerting you when you reach re-order levels. Check please– Billing is an integration that requires maximum simplification for users. POS systems do this effectively and also integrate payments for online orders. Customer Data handling: Repeat customers, complaining customers, pattern-ed customers and et all- It covers everything. Also helps to capture/maintain consumer behaviour in the form of data. Loyalty schemes– Customer loyalty cards/schemes are no longer just a fad. As competition crazily increases, retaining customers seems to be the new trick of the game. POS enhances your retention strategies by providing you with regular insights. It is a New Delhi-based start-up launched by two very well-known faces. Limetray is heavily funded and has adopted a unique restaurant-first approach to selling its products. As with most of POS service providers, the services come either singularly or as a basket- depending on your requirements. What differentiates this from others is the eye-for-detail. Solves very minute issues like multi-user logins/offline access/invoice design etc. This in addition to the regular services of Order/Customer/Inventory/Billing management. What most of their customer swear by, is the ease of use, customer service and the all-in-one RMS provided and executed most seamlessly. Having accumulated almost 200 clients in the first year of their operation, Limetray definitely boasts of a cutting edge. Limetray’s website, however, expects you to thoroughly know your needs and is extremely honest in terms of product offerings. While a lot of competitors might necessarily pool-in services and offer as a package, Limetray lets you know that if even if your requirement is smaller you can still get on Lime! Founded by a technocrat turned restaurateur in 2010 and one of the pioneers of POS technology for Indian Restaurants, POSist has had a very training-free approach to its products. This has inspired a lot of confidence in its customers. However, that which today is loved about it, was once a huge hindrance. Restaurant owners were very wary of buying a product that comes with no installations. Based out of New Delhi, POSist boasts of 24×7 support, theft control and supports all hardware for integration purposes. Apart from the basics, POSist also let you manage the franchisees/branches of your restaurant in a few clicks. The holistic software helps you with a one stop solution! From a QSR perspective, Franchisee management feature becomes the more important of all. In addition, POSist integrates with the likes of Paytm, Swiggy, Zomato etc to carve a niche in online ordering. After all, its all about the turn-around-time. POSist scores over its competitors in features like yield management/payroll management, is easy on the pocket and an extremely user-friendly interface. A Kolkata based company, RanceLab has a universal approach to business and ERP. Hence, it does not focus on only the food industry. RanceLab’s focus is Retail instead. Food and Beverages industry is one of the many, many industries it targets with its product FusionRetail ERP. The version of this software customized for restaurants is called FusionResto. One of the defining features is also employee management, end-to-end. The services are offered per user license and are equally supportive of all operating systems including iOS. The cloud solutions they offer come in a hybrid mode; i.e can be deployed on a public cloud or a private cloud or on-premise or in any combination of these. RanceLab has a different view on product offering. They market the same product in different versions, rather than having a separate product for each requirement. Hence, FusionResto is an all-encompassing POS software service. But you may tailor it as per your requirement and the cost will be adjusted according to your package. RanceLab scores over its competitors in sheer history. It has been around for more than 20 years(in some industries) and has international presence. Comes in 4 types- Lite, Express, Standard and Professional. The offerings are extremely transparent and the pricing is available on the website. This exhibits a lot of confidence and ensures only the clients confident about their needs and about RanceLab, shall approach them. Founded very interestingly by 4 foodies in 2011, Torqus started in the F&B space basically to help the restaurants that shut down due to operational inefficiencies. Started in Pune, Torqus has slowly moved from providing only POS solutions to providing the entire gamut of restaurant management services to its clients. Torqus quickly realized that chains were the future and dedicatedly produced the most comprehensive SCM system that manages everything from raw materials, delivery logistics to customers and tracking. Also, Torqus has a ‘pay as you go’ model where the customer is paying for only the services/apps he is using, nothing more. It is a very neat array of services and provides clarity to the client too, in terms of what specific requirement exists with him. Torqus boasts of a minimal downtime and businesses have recommended their POS for improving efficiencies and TATs. Conceived in Australia, Till POS was founded for a very domestic purpose. Later, having gathered the 8th best start-up award there, the owners branched out to Hyderabad, India and there has been no looking back ever since. The Till Intelligent Agent, TILL BOT, integrates with the OS you are using and helps you interact with your business (even remotely). TILL BOT gathers data from the POS and other reports, helps you with the right analysis when it is needed and does it intelligently. This apart from the usual set of services that come along with any cloud-POS offering. In this POS world where a lot of applications are either iOS dependent or Android, or where the user experience varies with the OS in use; Till POS offers seamless integration at every step. Whoa! It runs on Linux! This Hyderabad based company strives on innovation. ChefDesk is solid value for money. A very graphical UI ensures that almost no training is required for their product. Was one of the pioneers in offline data capture and management. All in all, it makes a very simple yet effective solution. ChefDesk came up with their mobile and tablet version since inception. It also reflected on the fact that the UI ought to be such that a person not so comfortable with reading should be able to go through the process seamlessly. Hence, the graphic and easy to read design. Restaurant POS is the spinal cord of any restaurant. It is always advised to start with a POS that suits your style of restaurant management and then move on to more complex Restaurant Management Software (RMS). 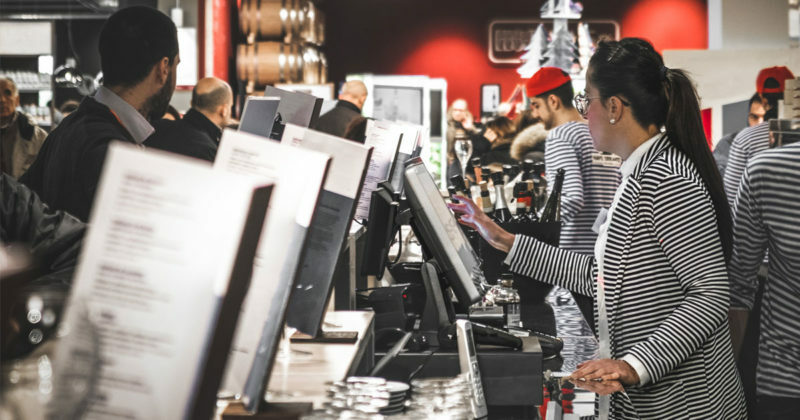 The POS you choose directly reflects in your output and customer experience. Choose the one that is simpler to use and simple to delegate. Keep in mind that you won’t be the only user of it. Also, navigation through the panes is very important. During rush hour, you might be required to switch applications within seconds. Always insist on demos. It certainly won’t be customized, but it gives you a fair idea of how it works. Lastly, don’t buy what’s in vogue; buy what suits you the best. Happy Restaurant-ing to you!